There are 10 comments for this item. I used to have a bread box, but no more. It would take up too much counter space in my current kitchen. Now I stash my bread in my toaster oven. Just have to remember to take it out if I need to use the oven. "Is it bigger than a bread box?" is a classic line, isn't it? I wonder if young folks today would know what this means? I guess this OLD dog can still learn new tricks. CJ, that may be true, but the phrase was immortalized on What's My Line? @Alan - That phrase was used a lot when playing "21 Questions". After figuring out if it was Animal, vegitable or mineral...the question was invariably "Is it bigger than a bread box?". And usually right next to the bread box was the "Cookie Jar". That show was What's My Line? 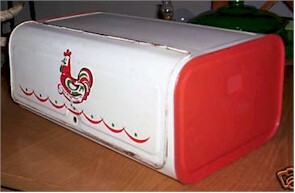 Some of us old folks may remember " Is it bigger than a bread box"when trying to guess an object on TV shows. keeping out the flies...pre ac days!